I was there Sept. 2, 2015, to support and help the performers with water breaks during the 45-minute-long performance in what was 93-degree weather but felt, hmm, hotter. Ann-Marie LeQuesne filming the “Fanfare”. “Wait, wait,” say the performers, amplifying the hand motion to wait while they count down the seconds. “Tweet, tweet,” go the piccolos, sounding like birds but also the screeching violins that begin the shower scene in “Psycho”. Pedestrians at 38th and Woodland Walk near the University of Pennsylvania Veterinary School were surprisingly polite and respectful. Some crossed the road smiling, thumbs up, and some hesitated, seeing what looked like a film shoot with costumed performers, and instead of crossing the road, they hesitated, waiting for a cue to cross. We assured them they could cross and be in the performance. Motorists tooted their horns as they roared past. Above are some camera-phone shots and below is a camera-phone video of the performance. 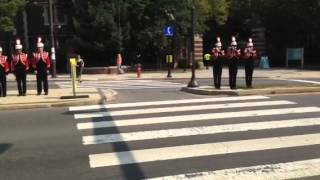 Fanfare for Crossing the Road from Ann-Marie LeQuesne on Vimeo.